Cycling, a photo by PhylB on Flickr. I said it with Léon and I am reiterating it with Anna. Balance bikes are a godsend to 40-somethings who need to teach their kids to cycle! No more back-breaking hours pushing junior round the park. Think about it logically - learning to cycle isn't about learning to pedal, it is about learning to balance. I put Anna at the top of a hill with a pedal-less bike and let her roll down it over and over till she became confident. Two days later she's on a proper pedal bike rolling down the hill, hours away from pedalling back up it under her own steam. 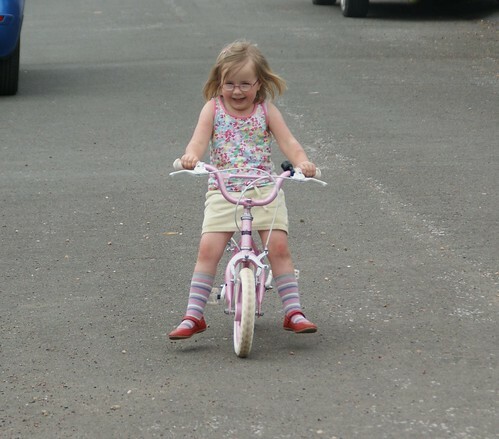 If I was a mini-dictator I think I'd ban the sale of bikes with stabilisers as a cycle-training device - they really are much more hassle than they are worth.